How many of you are watching the new Marie Kondo show on Netflix? All of you? I suspected. Me too. And while I’m frantically trying to teach myself the Konmari folding method and I’m definitely motivated to purge every room in the house – I’m also curious, is all this minimizing going to kill the art of collecting? While I’m all for minimalism, there is something so compelling about a well curated collection. Now as a kid, I collected cows and anything in a sunflower motif. I’m thrilled I was able to let those collections go by the wayside a long time ago. But ceramics. Glassware. Vases. When artfully collected and displayed a mass of like objects can add such personality to a home. While I fully agree we should consume less, buy less, what about pursuing personal passions? Sometimes blue glass just speaks to you and you need every piece you see.There’s also something to be said for simply indulging an irrational love. 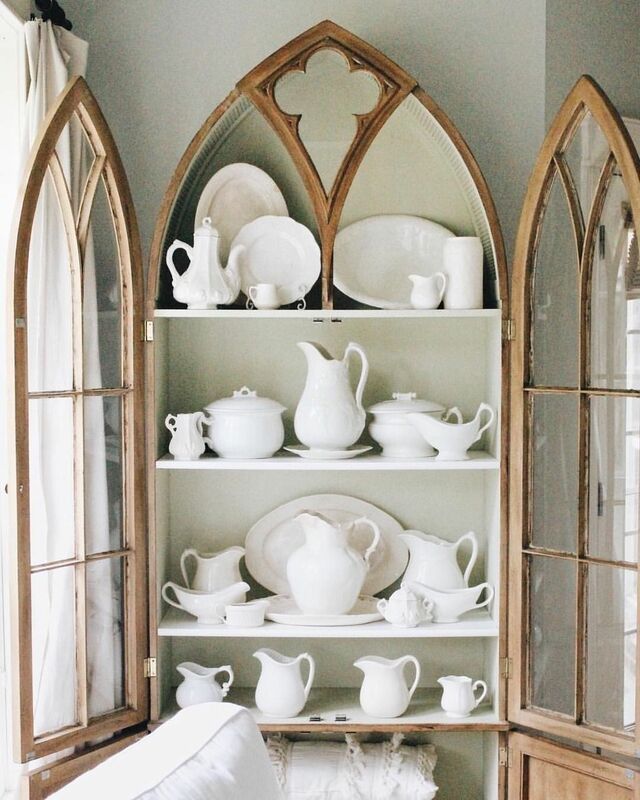 Be it vintage French porcelain. Or all things black. Charcoal drawings. Antique books. Whatever your vice might be, I would argue that there isn’t harm and actually amazing design value in hoarding with abandon. Ok, maybe not hoarding but you know what I mean. So if you have a a type of objet that sparks joy no matter if you have one, or 1,000 I say keep going. Collect those things that make you smile every time you look at them – and be sure to share that love with everyone who walks in your house. For more examples of amazing collections, check out my Display & Storage Pinterest board HERE. For more design ideas, CLICK HERE. And I’m curious – do you collect and display things? If so, what?? I used to have more cobalt glass, Spode Blue Room transferware, and Anchor Hocking Early American Prescut Glass than I room to display or would ever use. Prior to a move a few years ago I pared my collections down a manageable amount pieces that I actually use and enjoy. Yes!and keeping only the things that give you joy. If that’s only 3 things, you keep 3 things. If it’s 30, you keep 30. If it’s 300, you keep 300. If collecting gives you joy, collect! I love her method…and I collect everything! Iittila glassware and dishes, blue porcelain dishes, sugar and creamers, beautiful paper napkins, vintage ice buckets, German Nutcrackers, bone handled knives, etc. Everything has a home, perfectly need and tidy and I get joy just from knowing they’re there..and I use them all the time! I think you can merge the two worlds as long as it’s true love. When “we should buy less” is followed by “BUT I …” , there goes sustainability. Personally, I am a fan of sustainable living and collecting goes against the principles of it how much ever pleasure my greed might give me. I think of stores as places where I store my collections. My home is not a warehouse of idle goods. When possession starts to become a goal, rather than a tool that benefits me in a specific way, it’s a red flag. I doubt Marie Kondo will put a dent in consumerism in America. She might temporarily inspire some folks to declutter, but without the discipline to buy less, it will all come back in time. That discipline, is lacking. the kon mari method is not about minimalism; it’s about keeping the things in your life that spark joy. if every book in your 500+ book library spark joy, then keep them. i think another good question to ask yourself when deciding whether to keep something or not is “do you want to take this with you into the future?” and if the answer is no, then thank it and send it on its way. that question really resonated with me. and when you go through her method, you really get in touch with things that maybe you forgot about so your joy may be renewed with that particular item. it really is life changing if you take the time to do the steps. every episode of her show is worth watching. she has such reverence for every home she goes into, so respectful. she’s amazing.